Some friends and I visited Efeste Winery in Woodinville Washington's Warehouse Wine District last weekend. 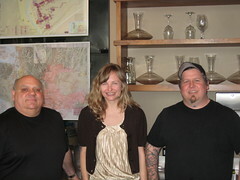 We were lucky to be able to meet, and chat with, co-founder/owner Daniel "Big Papa" Ferrelli, and winemaker Brennon Leighton, both pictured below with my girlfriend, Kristina, in the Efeste tasting room. We also got to taste some yet-to-be-released 2008 wines that had been opened for one of the big wine critics, who I'm not going to name. It was a total WIN for us, as the wines had been open a day or so, and all of the 2008's were showing beautifully. As always, tasting notes posted from CellarTracker. Nice write-up! Wow, look at those ratings! We're club members but haven't tried the Eleni or Emmy yet. Can't wait.